Let The Fan Fiction Begin! Er, Let More Be Written. Well, let's let Ms. Rowling tell you. 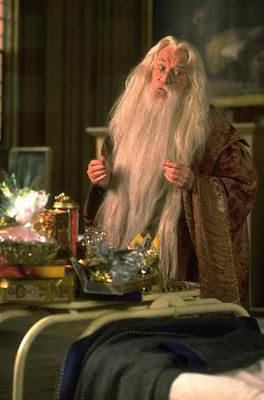 Harry Potter fans, the rumors are true: Albus Dumbledore, master wizard and Headmaster of Hogwarts, is gay. J.K. Rowling, author of the mega-selling fantasy series that ended last summer, outed the beloved character Friday night while appearing before a full house at Carnegie Hall. After reading briefly from the final book, "Harry Potter and the Deathly Hallows," she took questions from audience members. Rowling told the audience that while working on the planned sixth Potter film, "Harry Potter and the Half-Blood Prince," she spotted a reference in the script to a girl who once was of interest to Dumbledore. A note was duly passed to director David Yates, revealing the truth about her character. Rowling, finishing a brief "Open Book Tour" of the United States, her first tour here since 2000, also said that she regarded her Potter books as a "prolonged argument for tolerance" and urged her fans to "question authority." Not everyone likes her work, Rowling said, likely referring to Christian groups that have alleged the books promote witchcraft. Her news about Dumbledore, she said, will give them one more reason. Let the news go forth. Someone call for my Owl.